Back in October we discussed a sudden and likely unsustainable spike (for the month of September) in state and local government payrolls (see post). The increase was particularly visible in education. Now that we've had a couple of US employment reports, it is worth revisiting the subject. 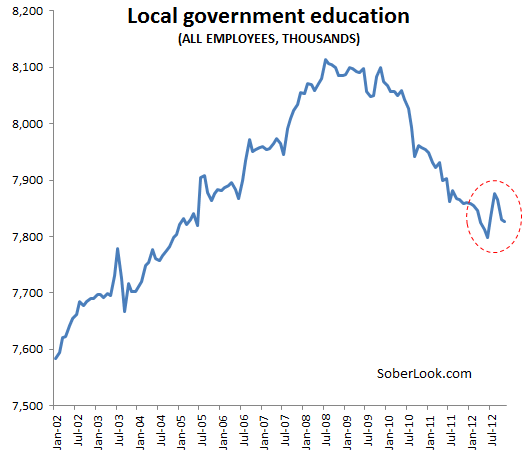 Specifically let's first take a look at the trend in local government employees in education. These represent mostly K-12 public school systems. It seems that most of the September spike has been reversed, suggesting that this was a temporary jump and the trend will likely resume. 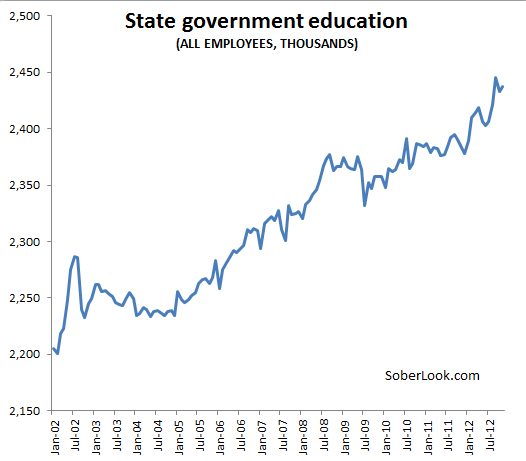 Now let's take a look at state (as opposed to local) government employees working in education. This population should include employment in higher education such as state universities. The growth trajectory there is quite different, with employee numbers near all-time record. How can the number of these government employees grow unabated when every other sector of local, state, and federal government (such as postal workers - see post) is shrinking payrolls? The answer may lie in the old familiar trend of rising student loan balances that continue to fund constant increases in higher education tuition (see discussion). There is always a need to hire more people at a university (or the state bureaucracy that supports it), and raising tuition is an easy way to fund it. The's why a great deal of academia has a limited appreciation for the recession the nation has undergone recently - the federal government has at least in part shielded them from the economic downturn. 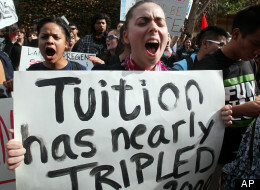 Huffington Post: - The average published tuition and fees for in-state students at public four-year colleges and universities increased by 4.8 percent, from $8,256 in 2011-12, to $8,655 in 2012-13. This was accompanied by a $325 increase in room and board charges for students living on campus, bringing the total cost of living to $9,205. According to the report, in 2012-13, tuition and fees for in-state students at flagship universities range from $4,278 at the University of Wyoming and $5,985 at the University of Montana, to $16,422 at the University of New Hampshire and $17,266 at Penn State [close to $20K for SUNY]. For students attending out-of-state public four-year colleges and universities, average tuition and fees increased by $883, from $20,823 in 2011-12 to $21,706 in 2012-13. Total charges, including room and board for students living on campus, currently average $30,911.